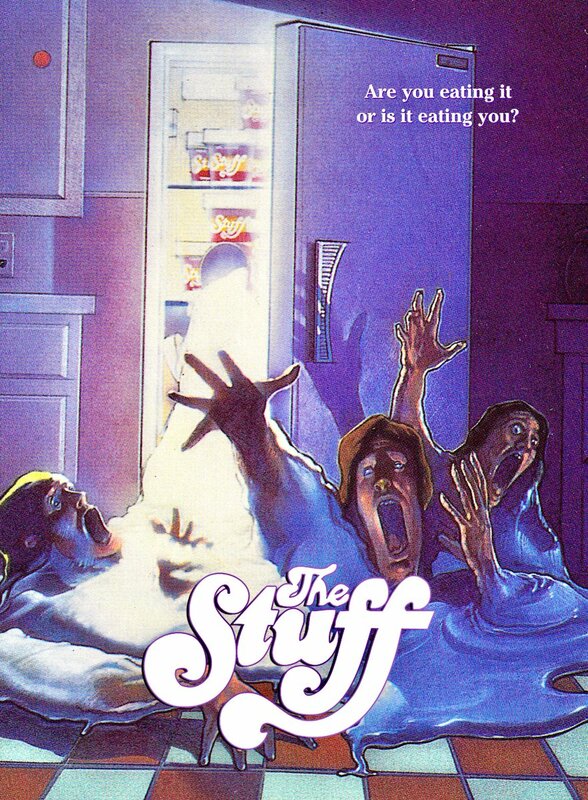 Tagline: Are you eating it…or is it eating you? We are all guilty of lusting after stuff we don’t need, of craving stuff we must have. In a consumer society fuelled by big business, we sometimes depend on that stuff to lend us purpose, to blind us from the often thankless realities of our everyday existence. As modern citizens we are slaves to consumer products. We are addicted to fast food, subsisting on a diet of additives and preservatives. We are worshippers of the brand name. Almost two decades into the 21st century, it has perhaps become a trite adage that the stuff we consume begins to consume us. 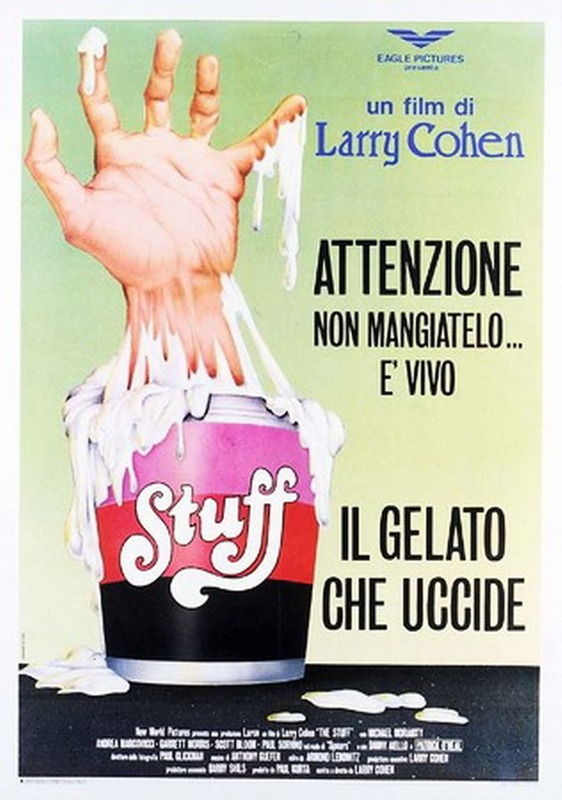 In writer/director Larry Cohen‘s world, that adage develops into something rather more literal, and infinitely more fun. 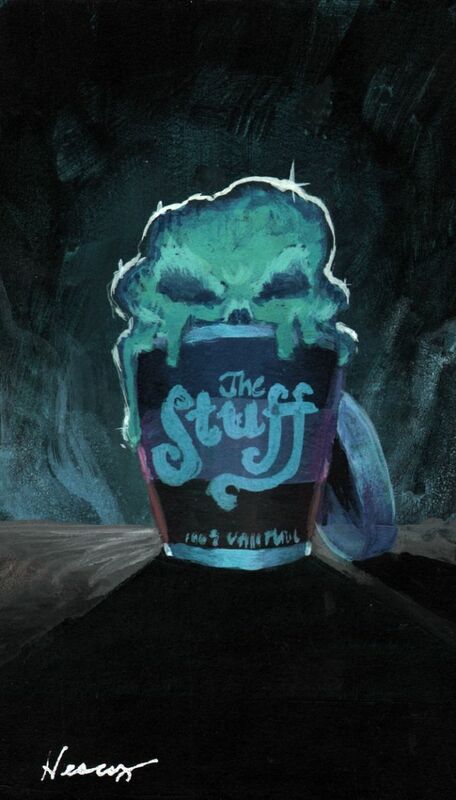 The Stuff is not your average horror flick, and I don’t say that lightly. At its core it is a cute nod to the Cold War B-movies of yore, the kind that unleash an unidentified threat on everyday suburban America. Only this time it is capitalism that seems to come under attack and our ingrained willingness as brand loyalists to jump on any old band wagon, while at the same time targeting those who dare to resist the latest craze sweeping the commercial spectrum. As a society we are attracted to trends, susceptible to peer pressure — something that multinational conglomerates and their armies of ad executives are only too eager to exploit. Here comes the choo-choo train! More than that, the movie acts as a commentary on the surreptitious nature of manufacturing and the unseen hazards we are so willing to overlook. This has perhaps never been more relevant than it is today. There was a time when dangerous items were produced based on our ignorance as an evolving society — asbestos for example — but today additives and preservatives are everywhere. Thanks to the growing demands of capitalism and mass production, even our most basic and natural foodstuffs are swimming with cancer-causing agents, while diet soda, promoted as being part of a healthy lifestyle, contains similarly dangerous ingredients. The fact is, even manufacturers are unaware of exactly what we are consuming, but as long as their products sell they couldn’t give a damn it seems. And nor could we. There is similar abandon in the business practices of The Stuff, the kind of product that becomes a self-fulfilling institution. After stumbling upon a mysterious white mush erupting from the earth, a petroleum refinery worker thinks nothing of popping it in his mouth and is immediately hooked. Soon enough this unexplained gook is everywhere — a creamy, delicious desert which is practically calorie-free and comes pre-packaged in a family-friendly pot. For the plainclothes suburbanites of modern America, The Stuff is a dream come true. Unfortunately for Jason (Bloom), that dream quickly becomes a nightmare as he watches his family succumb to The Stuff’s addictive qualities. Becoming a real-life food commercial, his parents aggressively pursue his allegiance, turning violent and vengeful when he fails to cooperate. Jason is still unconvinced, particularly when he opens the fridge to see The Stuff moving of its own accord, and after freaking out in a supermarket of wall-to-wall Stuff, he flees his home as the wholesome nuclear family gets set for meltdown. Jason is not the only one suspicious of the mysterious gunk sweeping the nation. Corporate bigwigs are beginning to feel the financial burn as consumers shun junk food of the less sentient variety for The Stuff’s sweetly addicting taste, and when they fail to reach those bribeable folk at the Food and Drug Administration they turn to industrial spy Mo Rutherford (Michael Moriarty), a cynical, southern dandy who will stoop to pretty much anything if the money is right. While investigating, Moe runs into ousted cookie king ‘Chocolate Chip Charlie’. Charlie is played by comedian Garrett Morris, who described the movie’s production as “crazy”, not taking too kindly to Cohen’s notoriously maverick ways. One can only imagine! Nobody told her she had food on her face. A step up from the Nike products we willingly pay top dollar for in order to become walking billboards, The Stuff takes brand loyalty to a whole new level, creating not only advertisers and purveyors, but ruthless guardsmen who will sacrifice their lives for the continued prosperity of the product. No wonder those bigwigs were so hellbent on stealing the formula! 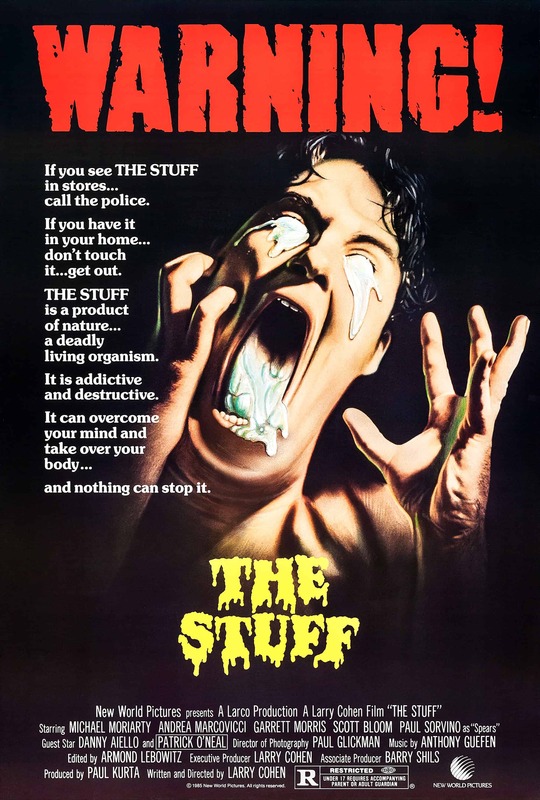 When entire families begin to go missing, Rutherford’s investigations lead him to a production site in Georgia where The Stuff has taken on a life of its own, and, subjected to a savage attack by a furtive batch hiding in his pillow, he realises that the product is more than just a benign organism. It is a parasitic entity that inhabits the body and mind before leaving its human carriage dead and empty (Pokemon Go, anyone?). Recruiting the help of resplendent ad exec Nicole (Marcovicci) and the commie-bashing Colonel Spears (Sorvino), Moe takes to the airwaves in an attempt to recapture the minds of America, but even if successful, this is surely a case of winning the battle and not the war. Perhaps there were other forces at work. 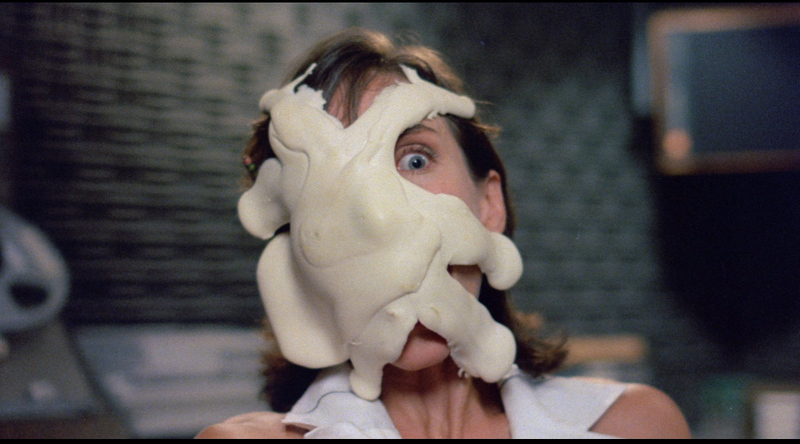 After agreeing to lend his voice to the Stuff-denouncing airwaves, supermarket celebrity ‘Chocolate Chip Charlie’ suddenly regurgitates a huge load of the sinister goop, which uses him to infiltrate the base of the resistance before reducing his head to a quivering pile of chunks. Having had his sleep interrupted by a batch of vengeful goo, Rutherford is left helpless as it clings to his face and attempts to suffocate him. But don’t fear, Moe! Girlfriend Nicole is at hand with a jar of oil and a match. Okay, darling. Try to stay calm. This might burn a little. 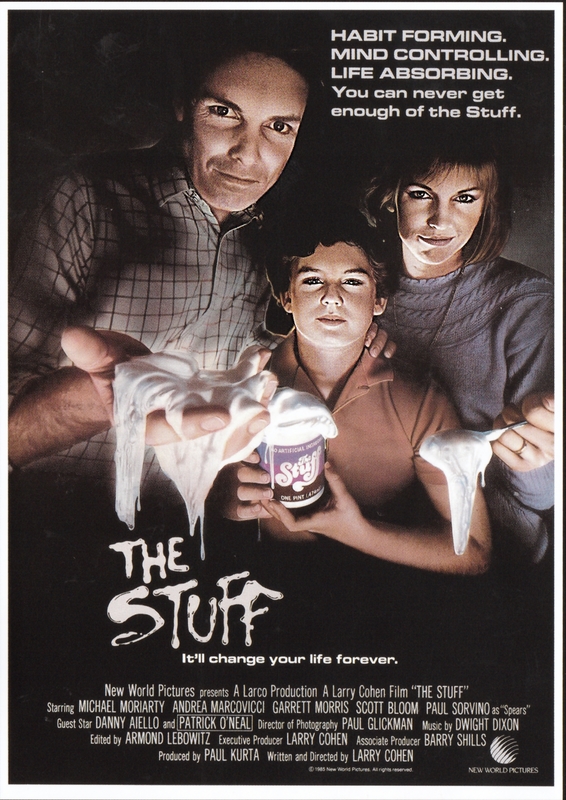 Having been forced to eat shaving cream as a way to convince his wild-eyed family of his allegiance to the The Stuff, Jason has a little accident in the back of Rutherford’s car. Jason: Excuse me, sir. I kinda just threw up in your car. Jason: I’m sorry. I mean, I just ate shaving cream. Rutherford: It’s alright. Everybody eats shaving cream once in a while. On the surface of things you would be hard-pressed to label The Stuff a horror movie, but the real fear lies in the grotesquely-veiled realities of the material. Beneath the hokey effects and commie-fearing B-movie nods, this is a razor-sharp satire on the perils of consumerism — the kind that has never been so relevant — and by the end of the movie I wasn’t so much concerned with exploding heads or polluted torsos, I was instead troubled by a single question: if capitalist strongholds such as Walmart could get away with selling The Stuff, would they? The answer is: yes, they probably would.